Refer to Wiring Diagrams Cell 124 , Power Mirrors for schematic and connector information. 2. Visually inspect for obvious signs of mechanical or electrical damage. 3. If an obvious cause for an observed or reported concern is found, correct the cause (if possible) before proceeding to the next step. 4. If the concern is not visually evident, verify the symptom and refer to the Symptom Chart. 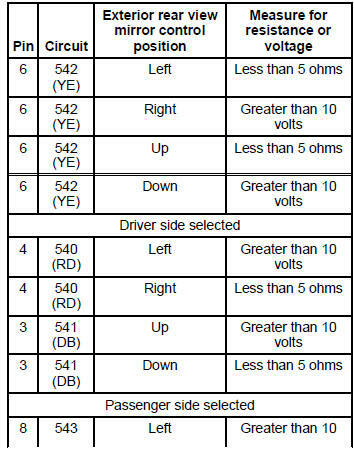 Refer to the Wiring Diagrams for connector numbers stated in the pinpoint tests. Exterior rear view mirror control. Central junction box (CJB) fuse 19 (15A). Exterior rear view mirror motor. Disconnect: Exterior Rear View Mirror Control C527. Measure the voltage between exterior rear view mirror control C527 pin 1, circuit 326 (WH/VT), harness side and ground. Measure the resistance between exterior rear view mirror control C527 pin 5, circuit 1205 (BK), harness side and ground. INSTALL a new exterior rear view mirror control. REFER to Switch- Exterior Rear View Mirror Control in this section. Measure the resistance between passenger exterior rear view mirror C622 pin C, circuit 542 (YE), harness side and exterior rear view mirror control C527 pin 6, circuit 542 (YE), harness side. Disconnect: Exterior Rear View Mirror C516 (Driver) C622 (Passenger). Disconnect the inoperative exterior rear view mirror C516 driver side or C622 passenger side. Select the inoperative side and actuate the exterior rear view mirror control to the down position, then the right position. REFER to Switch- Exterior Rear View Mirror Control in this section. TEST the system for normal operation. Measure the resistance between exterior rear view mirror control C527 pin 6, circuit 542 (YE), harness side and driver exterior rear view mirror C516 pin C, circuit 542 (YE), harness side; or between exterior rear view mirror control C527 pin 6, circuit 542 (YE), harness side and passenger exterior rear view mirror C622 pin C, circuit 542 (YE), harness side. GO to B4 for driver inoperative or GO to B5 for passenger inoperative. Measure the voltage between driver exterior rear view mirror C516 pin B, circuit 541(DB), harness side and ground; or between passenger exterior rear view mirror C622 pin A, circuit 544 (VT), harness side and ground. Actuate the exterior rear view mirror control to the up position. Measure the resistance between exterior rear view mirror control C527 pin 3, circuit 541 (DB), harness side and driver exterior rear view mirror C516 pin B, circuit 541 (DB), harness side. Measure the resistance between exterior rear view mirror control C527 pin 7, circuit 544 (VT), harness side and passenger exterior rear view mirror C622 pin A, circuit 544 (VT), harness side. INSTALL a new exterior rear view mirror motor. REFER to Mirror-Motor in this section. TEST the system for normal operation. GO to B7 for driver inoperative or GO to B8 for passenger inoperative. Measure the voltage between driver exterior rear view mirror C516 pin A, circuit 540 (RD), harness side and ground; or between passenger exterior rear view mirror C622 pin B, circuit 543 (DG), harness side and ground. Actuate the exterior rear view mirror control to the left position. Measure the resistance between exterior rear view mirror control C527 pin 4, circuit 540 (RD), harness side and driver exterior rear view mirror C516 pin A, circuit 540 (RD), harness side. Measure the resistance between exterior rear view mirror control C527 pin 8, circuit 543 (DG), harness side and passenger exterior rear view mirror C622 pin B, circuit 543 (DG), harness side. INSTALL a new exterior rear view mirror motor. REFER to Mirror-Motor in this section. Disconnect: Exterior Rear View MirrorC516 (Driver), or C622 (Passenger). Disconnect the suspect exterior rear view mirror C516 driver or C622 passenger. 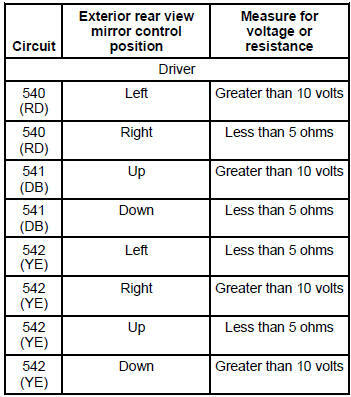 Measure for voltage or resistance at the suspect exterior rear view mirror harness side, while actuating the exterior rear view mirror control according to the following chart. Is the circuit logic OK? REPAIR the circuits. TEST the system for normal operation. INSTALL a new exterior rear view mirror control. REFER to Switch-Exterior Rear View Mirror Control in this section. Remove the exterior rear view mirror control. Leave the harness connected. 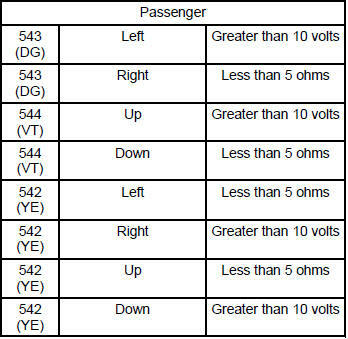 Measure for voltage or resistance at exterior rear view mirror control C527 while actuating the exterior rear view mirror control according to the following chart. 1. Remove the door trim panel. For additional information, refer to Section. 2. Disconnect the power exterior rear view mirror electrical connector. 3. Remove the nuts and the power exterior rear view mirror.